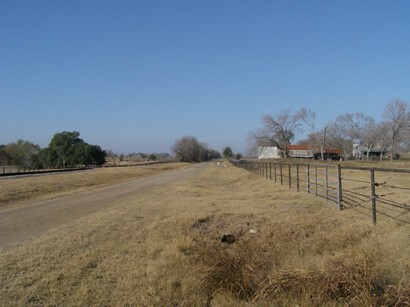 A man named Henry Russell held deed here on the Columbus to Gonzales Road when Texas was still a Republic. After the Civil War as Anglo settlers sold out to the arriving German setters, the larger land grants were broken up to accommodate more modest farms. 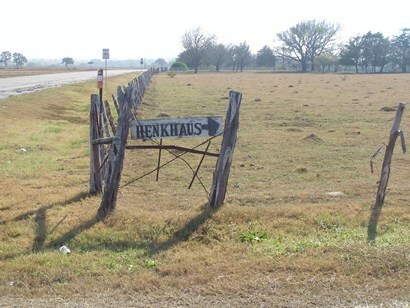 John Henkhaus built a cotton gin and store alongside the San Antonio and Aransas Pass Railroad in 1887. The community waited until 1898 for a post office which operated in Henkhaus� store. It closed just nine years later. The tiny community enjoyed the tranquility of the region, suffering no disasters and making little, if any, history. Cotton was the sole enterprise other than family gardening. After WWII, with a population remaining around 50 residents, Henkhaus� school merged with Moulton�s school and the old gin closed. Cotton farming gave way to a cattle and hay economy. Although the last businesses in Henkhaus closed years ago, the population remains at around 60 people.